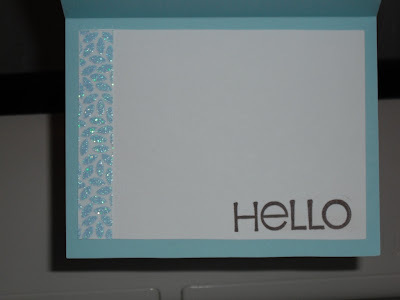 Can't you tell that I love doing these little note sets?? 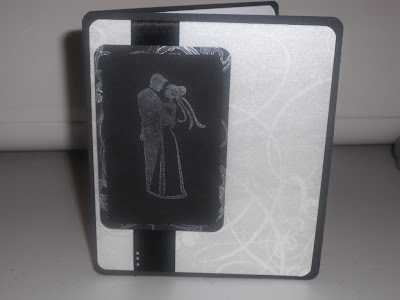 I was cruising around J's and found some Sizzix clear stamps on clearance (my favorite way to find things!!)! 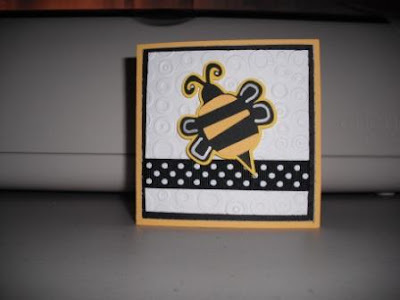 Throw in the 09 Summer Stack from DCWV and you get the 'Bee Happy' note set! 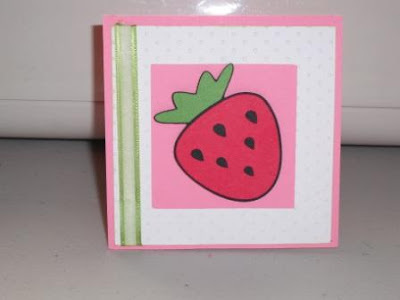 A really sweet 4x4 note set that features the strawberry from the Indie Art solutions cart! This was my first card set for the summer- and what's better than a strawberry?! The border was cut from the PS cart using the Roly Poly feature. 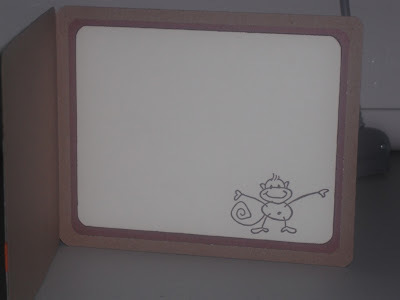 A 4x4 note set that I was inspired to do- one night when I was really sleepy! I was fighting both the sleep monster and the crafting bug at the same time and this was the result! LOL! 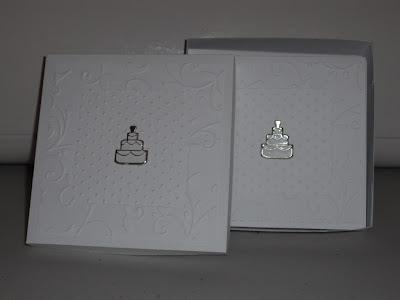 Embossed the card and used some really pretty blooms I got from Michael's- the whole set took only about 30 minutes! Flower: Not sure of the producer, but I got them from M's! 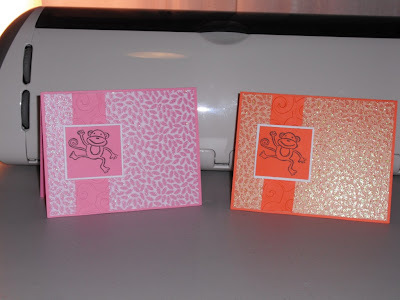 This is one of my 4x4 note sets. Walk In My Garden is quickly becoming a fav of mine- the bee is so cute! This is one of the earlier sets, so no box for this one. 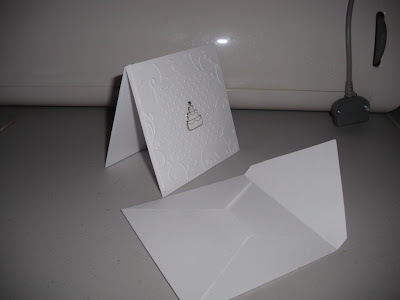 Yet another Joy Fold! I made this one for a little friend of mine- just to say hello and check on him. 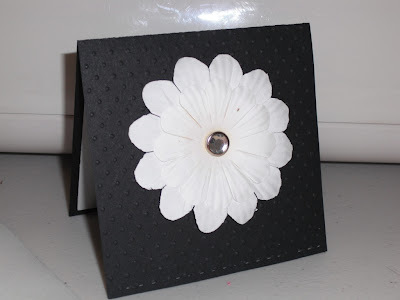 The Craft paper is so versitile- makes making masculine cards easier for me. 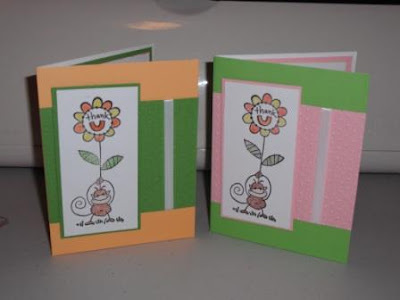 And the DCWV Green Stack is wonderful- so glad I was able to use it on this project! 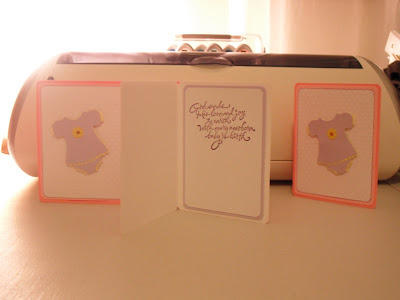 Baby cards are a must-have for any stash! I was able to grab the New Arrivals cart on sale at J's- so I had to test it out... I was happy with everything except my pencil work around the collar- so I didn't do that on the other 3 cards. In the end though- I thought they turned out really sweet. Some more cards for my stash! 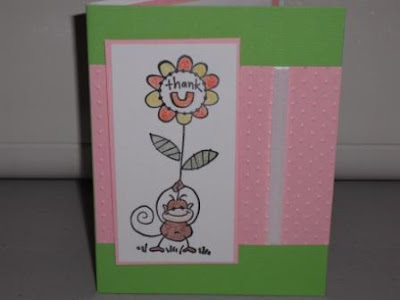 I made a set of 4 really simply thank you cards to have on hand. 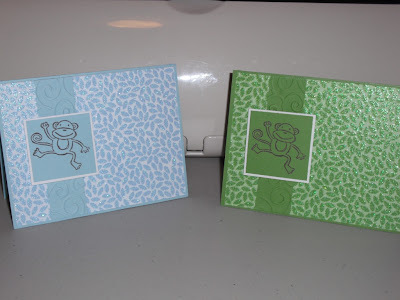 The Stampendous Chantigo Monkey is the cutest! I just stamped and colored him in with colored pencils for this one. 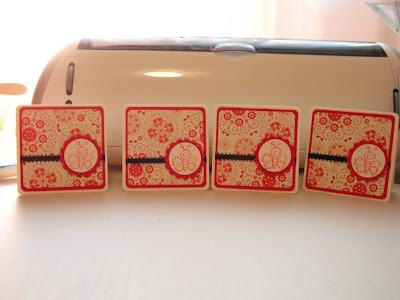 And since I used some premade cards from DCWV, the whole set was done rather quickly! I don't know what it is, but these little guys are a recurring theme in a lot of my projects. Maybe it's because they are so stinkin' cute! LOL! 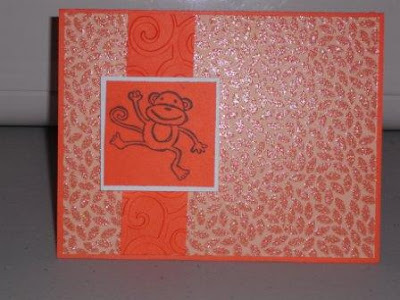 After seeing the first monkey card, a friend requested one for her daughter. I wanted to create something unique for her- while mantaining the style and this is what I came up with! The monkeys are acutally rub-ons I got from J's. 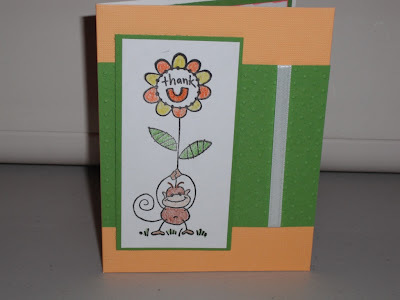 I had these cute little stickers, so I made a card for a friend who loves monkeys! 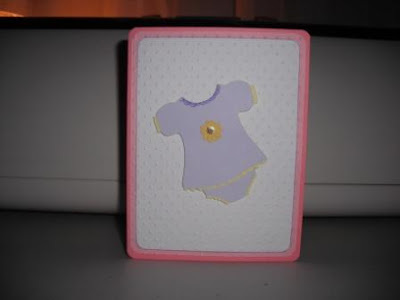 This is also the first card I made using the Craft paper by the Paper company- I don't know what it is- but I love that Craft paper!! And I really am developing a 'thing' for stickers too... They truly come in handy when you are on a time crunch! LOL! 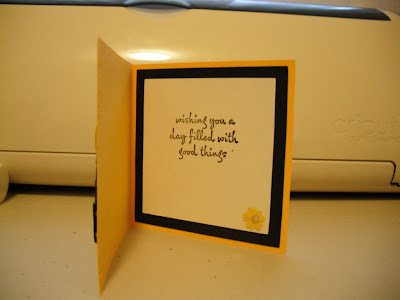 Here a quick --but cute-- card I did for a co-worker's mother. I loved the colors on this one- they looked so vibrant and bright in person. 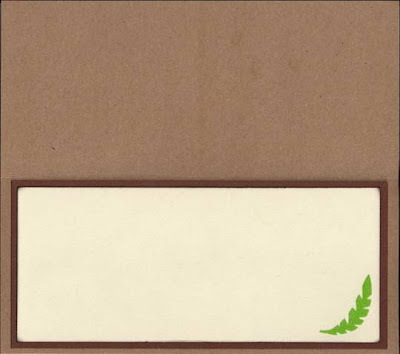 The inside is a stamp I just got from JoAnns-- by Inkadinkado-- it really inspired the whole card since her mom really likes sweets. I am happy to report that she really liked it!! 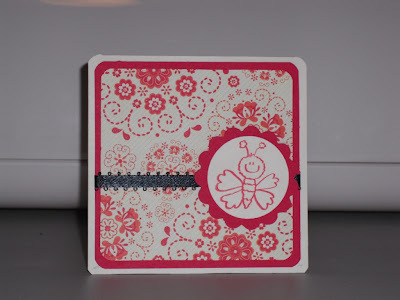 Oh- here is the link for the tutorial as well- courtesy of Split Coast Stampers! 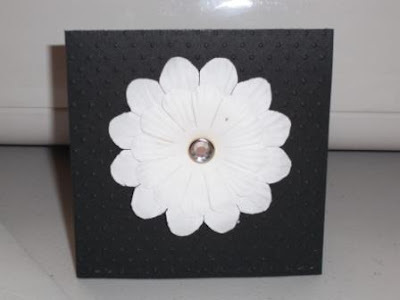 I can't remember where- but I got the inspiration for this card and just had to make it! Credit goes to whoever I 'lifted' this one from! 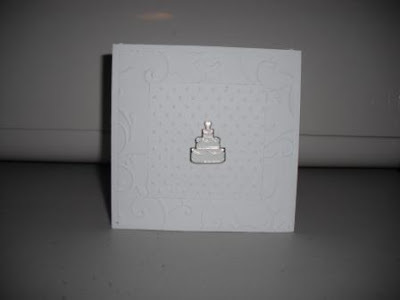 Needed to make a birthday card for a friend's MIL. She's a really nice lady that makes some excellent banana bread!! LOL! Didn't have a whole lot of time, so I used a DCWV premade card as my base. 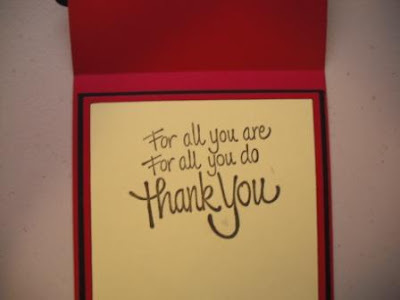 This is a thank you card I did for my stash! I love this card! 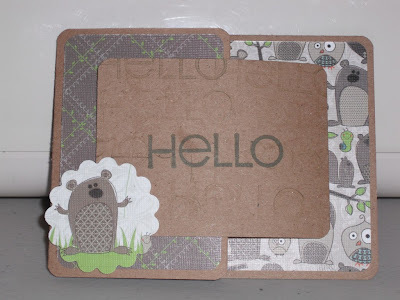 I made it for my stash and actually ended up using it as a welcome card for a new co-worker. 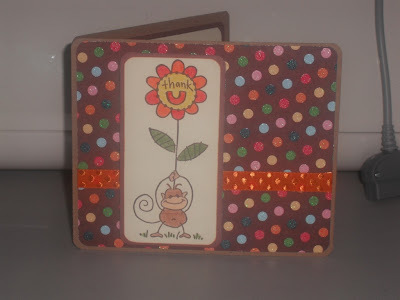 Decorative paper is from the DCWV Spring Stack and the bloom is from a set of 4 I got from M's.